NYU Stern and L2's goal is to convene the most meaningful gathering of CPG and prestige executives in a high-impact two-day academic setting, each year, to discuss the intersection of innovation, brand and digital. NYU Stern School of Business and L2, a digital benchmarking firm founded by the School’s Professor of Marketing, Scott Galloway, held the first annual Digital Leadership Academy at Stern from July 13-14. The two-day event, featuring speakers from Stern, other leading business schools and L2, hosted C-level executives from some of the world’s most iconic consumer brands. 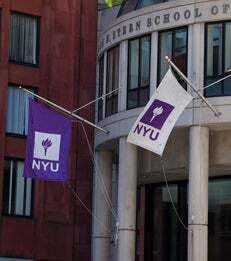 "NYU Stern and L2's goal is to convene the most meaningful gathering of CPG and prestige executives in a high-impact two-day academic setting, each year, to discuss the intersection of innovation, brand and digital. Our inaugural gathering boasts 350 executives from 120 of the business world's most iconic firms and brands," said Scott Galloway, Founder and Chairman of L2 and Clinical Professor of Marketing, NYU Stern. The L2/NYU Stern Digital Leadership Academy focused on aligning business fundamentals with digital topics. Participating companies were encouraged to send individuals who have been identified as high-potential emerging leaders within the organizations. "Digital transformation has revolutionized the way businesses and brands across all sectors engage with customers," said Peter Henry, Dean of NYU Stern. "The business world needs leaders who understand this rapidly changing landscape, and who are agile enough to adapt and evolve. We are delighted to co-host this important dialogue and to serve as a convening place for scholars, executives and business leaders to share views and spark innovative ideas." Over 350 participants from retail, beauty, CPG, OTC, luxury and big box brands discussed topics including: Amazon The Disruptor, The Fragility of Market Leadership, Strategic Innovations, The Digital Organization, The Laws of Globalization, Mobile, Entrepreneurship, Social Platforms, Competing in Asia, Video, Building and Measuring Brand Value, Leadership Stories, Business Strategy, Negotiations and Measuring Brand Value. L2 is a member-based business intelligence firm that benchmarks the digital performance of over 1,800 brands across 14 industries across nine regions globally. Our proprietary Digital IQ Index® is the global standard for measuring digital competence. We analyze 1,250 data points across site & e-commerce, digital marketing, social media and mobile to provide brands with actionable, data-driven insights on their digital performance.